Big Ideas » Meet the 2018 Big Ideas Award Winners! Meet the 2018 Big Ideas Award Winners! This year’s Rudd Family Foundation Big Ideas Contest launched in September 2017. In November, the Contest received over 300 pre-proposal applications, representing over 1,000 students across 11 campuses. After a preliminary round and a final review, 42 teams were awarded prizes across 8 different categories, with award amounts ranging from $2,000 to $10,000. 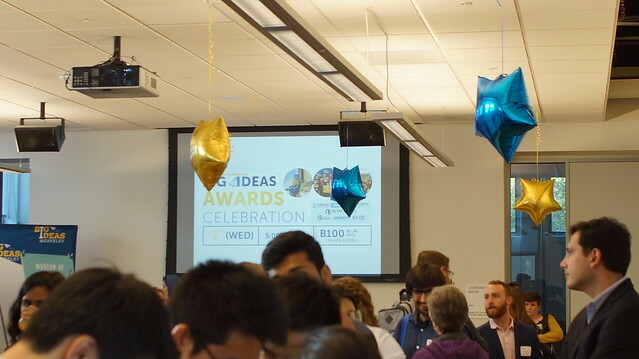 In addition to the category winners, several teams were recognized with additional honors at the Big Ideas Contest end-of-year-events. Check out photos from the Pitch Day and Awards Celebration events! Based out of The Suitcase Clinic, Artists in Residents provides a meaningful and enriching artistic outlet to Berkeley’s homeless residents, allowing participants the opportunity to grow through their art and gain compensation for their work. Through public events that showcase the artistic side of this underrepresented community, Artists in Residents will facilitate a more complex understanding of homelessness throughout the Berkeley community. The Museum of Tomorrow is an immersive, interactive, fun and educational pop-up museum on climate change targeting Millennials to promote behavioral change. Through six interactive exhibits and a behavior change challenge, it translates an abstract and distant challenge into a tangible and immediate experience for the public. Furthermore, the Museum provides easy, accessible, everyday solutions to battle climate change. It attracts audiences by bridging the gap between popular mainstream culture and sustainability with highly engaging and Instagrammable exhibitions. The exhibits are designed to travel after opening for 6 months to reach a wider audience. The Museum will be launched at UC Berkeley and then travel to other UC campuses and cities around the world. Loom is a platform rooted in life review therapy that guides families to collect, curate, and share digital heirlooms (recipes, videos, voice memos, etc.) for generations. Loom provides a place to organize lasting memories and connect with users’ closest loved ones. Loom is designed to help people easily collect mementos from relatives, the internet, and shoe boxes filled with artifacts to bring together users’ favorite memories enhanced with the stories behind them. Loom guides users with crafted personalized prompts, created by content experts, designed to guide families to tell these stories and attach an annotation (voice or text) to them to store forever. Loom connects people, adding hands-on support to help families explore their heritage, record memories and artifacts, and share legacies. In the US, 1 in 4 renters spend half their income on rent. City life has become increasingly unaffordable while residential spaces remain empty during the day. Meanwhile, technology is disrupting the traditional work structure leading to ever more freelancers and remote workers. The demand for flexible workspaces during the day is soaring, as expensive co-working spaces and crowded coffee shops mushroom in cities. Hiven addresses the mismatch between unused residences and need for workspace. Based on a sharing-economy model, Hiven allows anyone, anywhere, to run their own co-working space at home. Hiven provides the first micro-rental platform of residential spaces for remote workers. Members can access reliable home offices with the amenities, the comfort and the social component they need to thrive, while creating an additional source of revenue for hosts. The Hiven model promotes circular economic values and revitalizes local neighborhoods. The rise of smartphone usage has changed communication patterns and paralleled an increase in individuals reporting feeling lonely and disconnected, especially amongst young adults. As a result, crisis helplines are expanding their text services to keep pace with new communication trends during a time of growing need. However, tools for training counselors remain time consuming or provide insufficient practice. TextTrainer is leveraging recent advances in natural language processing and partnerships with crisis helplines to build a dialog system to train crisis counselors on how to intervene and de-escalate crises. With this system, counselors can easily practice formulating text responses, get feedback on their responses, and gain expertise in a low pressure setting without putting any individuals in danger, thus helping crisis centers meet the rising demand for their services. Better Journey provides a platform for organizations to more effectively engage with refugee communities at scale and track key milestones along a refugee’s path. Through a web based messaging application on the refugee’s phone, caseworkers define milestones for their refugee clients and customize various forms of engagement around those milestones. Caseworkers can send the right message at the right time along a refugee’s journey based on defined triggers to provide reminders, motivation and information regarding milestone targets. Caseworkers can also follow up and solicit information from refugees asynchronously and have responses automatically upload to their current case management system. Finally, Caseworkers can effectively track the progress of their cases and intervene if necessary. Engagement and relationship building are at the core of the platform and the team believes that better engagement leads to a better journey and ultimately better outcomes. Using basic behavioral finance principles and leveraging the Donor Advised Fund structure, GivingFund makes it easier for young professionals to give, give more, and give more intentionally, all through a single, online interface. Users can automatically donate a percentage of their paycheck to their personal “givingfund”. GivingFund pools the capital across funds to invest in the impact investing market, tax-free – giving users access to more deals than the average retail investor. Users can donate the returns and their original principal, to any NGO of their choice – when they want, how they want. By providing space between the monthly payment and the donation experience, and by providing a central spot to track and measure all of a user’s impact throughout the year, GivingFund believes it can turn the pain and obligation of giving that Millennials feel into joy and even excitement, and double the amount of impact capital Millennials deploy. Today there are 65 million people that have been forcibly displaced, including 22.5 million refugees. As this humanitarian crisis continues to escalate, the international system is struggling to adapt. Only 2% of refugees have access to durable solutions, and the remaining options are long-term encampment, urban destitution, or a perilous informal journey. In each context, refugees lack access to relevant information and services. MarHub is building a migration management platform to transform how refugees and migrants access information and services, and how organizations and governments provide them. Short-term, MarHub’s chatbot will help refugees navigate the asylum process by providing tailored legal information and connections to NGOs. Long-term, MarHub’s integrated case management platform will help migrants and humanitarian actors work together to provide and evaluate information and services. MarHub ultimately seeks to improve access to protection and durable solutions that respect the dignity of people on the move. Healthy LiPHE is a readily accessible “one-stop-shop” mobile health application that targets disadvantaged adolescents via a youth-friendly platform. It contains features such as: Clinic Finder, Condom Finder, Sexual Health, Mental Health, Frequently Asked Questions, Ask a Question, and PHE Connect. Existing online resources are neither comprehensive nor youth-friendly and teens may turn to online resources that contain invalid information. Additionally, with the uncertainties surrounding healthcare accessibility, it is imperative now more than ever to provide an equal opportunity for youth to make healthy decisions informed by high quality health information. With these tools readily accessible on the user’s phone, Healthy LiPHE is ideal for last minute decisions, and can lead to better health outcomes in the future. Healthy LiPHE is designed to be comprehensive enough to appeal to both youth with or without prior health education. Through its engaging interface, youth will feel empowered to take control of their health. One Village Philippines is a multidisciplinary team of fifteen engineering students within the UC San Diego Global TIES program. This team is working together with the non-profit organization Gawad Kalinga to support its mission of alleviating poverty for communities across the Philippines by providing humanitarian solutions via engineering services. Due to limited lighting, nighttime travel is especially difficult for residents and they often feel unsafe. Additionally, power outages often occur within the community due to electrical failures. Through the development of a sustainable lighting solution, the SolarE team addresses the need for sufficient lighting throughout the village at night and catalyzes social entrepreneurship within the Filipino community by empowering villagers to produce and sell the solar light locally. Plastic waste. Poor roofing. Unemployment. Poverty. — Four developing world problems with one solution. In sixty years, the world has produced 8.3 billion metric tons of plastic and recycled only 9%. In developing countries, plastic waste is generally burned, releasing pollutants into the atmosphere. Quality roofing material is often unaffordable for many subsistence farmers and poor urban dwellers. Trash to Tiles (T3) addresses all of these issues by changing the paradigm to use plastic waste as a vast, profitable resource. T3’s innovative, energy and cost efficient technology produces quality, affordable roofing tiles from recycled plastic using only one machine which entrepreneurs can easily finance. Housing is made safer and more comfortable, and plastic waste and atmospheric pollution are reduced. The franchise business model empowers local entrepreneurs to achieve economic independence and enables Trash to Tiles to scale rapidly. The rise in home solar generation is reducing emissions from the residential building sector. However, net energy metering (NEM) policies are being phased out in many states, making residential solar projects less attractive from a financial standpoint. EMPOWER is addressing this problem through the development of a modular, affordable, residential energy management system that leverages the predictive power of modern machine learning to simultaneously optimize local energy generation, storage, and flexible loads within a house or microgrid. It integrates weather, photovoltaic, and user behavior forecasts to increase efficiency and is retrofittable to existing homes. In areas without NEM policies, EMPOWER estimates savings of over $500/yr for a product with a target price of $200-300. Solanga builds solar powered community centers, or Solanga Hubs, in areas that lack electricity. The Hubs provide people valuable services at affordable prices – such as cell phone charging stations, computers, televisions, well-lit study or social gathering spaces in the evening and electric water pumps. These services are sold on a per-use basis. The Hubs are 3rd party financed. Solanga’s business model lowers the cost of critical services to individuals by scaling and centralizing the energy system for the community at large. Social centers where people exchange goods, services and ideas are of utmost importance but are harder to create in the developing world due to the absence of well-lit spaces. Solanga Hubs solves this problem and also reduces CO2 emissions by minimizing the need for dirty kerosene lanterns and diesel generators. Solanga is the WeWork + Internet Cafe + library of the developing world. Smallholder farmers in low resource settings are forced to sell their crops at low prices shortly after harvest to avoid post-harvest losses, which results in low agricultural financial gains and lack of food security among farming households. A proven solution is the use of metallic silos for long-term storage of crops with less than 1% loss from pests or any other form of degradation. The TRAM project proposes to increase the distribution of metal silos among Ugandan smallholder farmers through an innovative business model that allows the farmer to get the silo at a low initial cost and complete payments through monthly installments. This project has the potential to provide safe food storage systems to 6 million households in Uganda alone and spread to the East African community and other countries in sub-Saharan Africa. At UC Berkeley, student food insecurity is rampant while food waste is pervasive. Between expensive meals eating out and emergency provision at the Food Pantry, thousands of students are left without a consistent, affordable food option while Cal Dining and the campus gardens are flush with unused food that’s unable to be reliably processed and distributed. Meanwhile, the Berkeley Student Food Collective has pioneered a student-run food waste recovery program that focuses on addressing food insecurity using a sustainable business model in a kitchen that’s too small to scale. Our Campus Kitchen and retail café will operate as the hub of a new paradigm for campus food: a volunteer-operated, student-run kitchen that would engage students in food education, community service, and food business. Current farming practices are degrading soil at a rate of 75,000 acres per day, with about a third of global soil considered severely degraded and the remaining projected to last only 60 years. By reducing agricultural productivity, soil degradation is responsible for a global annual economic loss of $27.3-billion. ArboSol addresses this problem locally–in California’s San Joaquin Valley (SJV)–where soil degradation is anticipated to cost California $3-billion in annual revenue and up to 64,000 jobs by 2030. ArboSol uses a novel sunlight-powered desalination to remove salts from saline agricultural drainage; producing a high-purity water that can be reused for irrigation. Through a leasing model, ArboSol will partner with corporations operating in the SJV to collect salts for resale. By implementing ArboSol on a large scale (15% of agricultural fields in the SJV), the effects of soil salinization can be reversed, while producing $59-million worth of salt each year. In developing countries, the cost to diagnose meningitis remains high and therefore many neonates are denied quality healthcare. Approximately 126,000 cases of neonatal bacterial meningitis occur every year in low income countries of which 25–50% develop brain damage and about 40-58% of patients die. The gold standard for diagnosing neonatal bacterial meningitis is a cerebrospinal fluid (CSF) culture. Lumenda provides an accurate and rapid method of diagnosing bacterial meningitis in neonates in low-resource settings. It facilitates rapid intervention and avoids wasteful prophylactic administration of antibiotics by analyzing the optical properties of the CSF to rapidly detect bacterial meningitis at each point along this pathophysiology. The rationale behind the device stems from the clinical observation that CSF turns from clear to opaque when infected with bacterial meningitis. In rapidly urbanizing areas, small exhauster truck businesses are unable to keep up with the demand for pit latrine emptying services due to inefficiencies in their operations. Thus, when a latrine fills in most low-income urban areas, manual emptiers use buckets to empty the waste and dump it in the environment. This results in high rates of diseases such as cholera and dysentery. Loo Lab enables exhauster trucks to grow their businesses by improving the efficiency and profitability of their daily operations. Loo Lab’s integrated suite of technologies connects truckers to customers, intelligently routes truckers to clusters of customers, and streamlines payments for emptying services. The technology allows individual trucks to save time and money. This makes it possible for exhauster trucks to expand their customer base, empty more low income customers, and prevent waste from being dumped in the environment. The incidence of surgical site infections (SSI) in low-middle income countries (LMIC) is up to six times higher than in developed countries. SSI can be prevented by ensuring that instruments are clean and sterile between procedures. In the developing world, this proves difficult with limited resources. Current methods for decontaminating surgical instruments involve a bleach soak, which does not effectively remove the organic matter, and the bleach itself is corrosive to the stainless steel tools. SurgeCare is a locally sourced solution in the form of a foot-powered surgical instrument washer, which utilizes pressurized and recycled water, has the potential to provide surgeons in LMIC with clean instruments, thus decreasing the frequency of infection related to surgery. Many girls in rural Uganda are frustrated with using cloth and banana fibers to manage their menstrual periods, and the standard pads on the market are too expensive for them to afford. In addition to being uncomfortable, the cloth or banana fiber pads can cause infection. Ecosmart is addressing this problem by developing a sanitary pad made from sugarcane residue that is affordable, high quality, and made locally. By leveraging locally available materials to minimize costs in production, Ecosmart will make low cost pads that will improve menstrual hygiene for girls and women in rural Uganda. Social isolation is a prevalent issue known to cause loneliness, depression, and other health ramifications in the growing population of elderly. While some community programs for isolated elders exist, very few are effective or accessible. Forget Me Not is an intergenerational nonprofit organization that tackles this issue by partnering seniors with teen volunteers in weekly companionship phone calls. Seniors simply sign up for the program and are immediately paired with a trained volunteer who calls them every week. The program allows any older adult to participate with the only requirement being access to a telephone, thus eliminating any physical, geographic, or technological constraints. The calls are mutually beneficial and conducive to the formation of lasting meaningful bonds. More than 18 million people in the US are currently at risk of suffering from lead poisoning due to the high amounts of lead in their drinking water. This is usually contained through the slow and natural development of a scale in lead pipes; however, depending on the scale composition and water quality, this scale may dissolve, exposing the population to the deleterious health effects of lead. Once the scale dissolves, it takes years for it to form again, causing well-known health crises like that in Flint, MI. The team has developed a novel, fast and cost-effective technology to solve this problem, termed ALPS (Accelerated Lead Pipe Scale-buildup), an electrochemical method that accelerates the development of a protective scale in lead pipes. By providing an effective and accessible method for controlling lead in drinking water, ALPS will prevent health hazards like that of Flint, MI. Uganda does not have a dedicated emergency response number (i.e. 911 in the US) and the government has time and again failed to set up an adequate and reliable public ambulance service resulting in slow emergency response times, additional injury to casualties and an altogether diminished chance of survival in critical cases. The Coordinated Emergency Response System (CERS) uses USSD short codes to allow casualties/witnesses in emergency situations to access help using any type of phone. Punching the short code into a phone and following a few prompts allows the user to access a trained ride-sharing taxi operator who quickly transports them to the closest health facility. CERS’ system has the potential to impact at least 40,000 Ugandans who do not make it to the hospital within the “golden hour” by providing a fast, safe and appropriate means of transport. Opi-Aid is a protein-based diagnostic for cheaper and more sensitive opioid detection. With over 289 million opioid prescriptions written each year in the U.S. and the public’s eye on the “silent epidemic” of addiction, there is a growing need for drug testing to better control the misuse and abuse of opioids. Currently, opioid testing involves an immunoassay screen; however, the screening antibodies are primarily designed to bind morphine and its derivatives, resulting in large false positive and false negative rates and leading to unnecessary confirmatory testing. The Opi-Aid leverages the binding properties of the opioid receptor; thus, this technology is sensitive not only to all current opioid drugs, but also to future opioid derivatives and analogs. In streamlining and improving the opioid testing process, Opi-Aid will help providers and patients safely alleviate and manage pain. Trauma disrupts every person’s blood clotting ability to stop bleeding and remains the second leading cause of preventable death in industrialized countries. With no effective medical device to provide physicians with full blood clotting data at the site of injury, medics resort to blind dosing that carries significant risk of internal blood clotting or having no effect altogether. While deployed, injured soldiers may not receive proper treatment for up to 24 hours. In the civilian sector, patient treatment may be delayed up to 3 hours before the data can be obtained at a hospital. At Innovis Medical, the team provides health care practitioners with the tools they need to diagnose clotting dysfunction at the point-of-care with a solid-state, disposable sensor capable of operating in mobile situations. Suturing is a low-complexity yet technical and time-intensive step of every open surgical procedure. In recent years, few innovations in wound closure have worked to improve the process of closing open incisions. The QuickStitch device takes an innovative approach to enhancing the efficiency of the hand-suturing process, which is considered the gold standard in wound closure. By automating the delivery of the needle through the tissue, the tying of the surgical knot, and the cutting of the suture tail, QuickStitch helps save precious and costly OR time by accelerating and simplifying the wound closure process. The device can be utilized in the closure of any layer of tissue and promises the same quality of wound closure outcomes as hand-suturing. Most importantly, QuickStitch will decrease time spent suturing by more than 75% and therefore will reduce patient risk by decreasing time spent under anesthesia. Every patient’s nightmare is putting one’s health at risk by receiving a failed surgery. In the US, medical errors kill more than 200,000 patients per year, making it the third-leading cause of death. The avoidable morbidity is partially due to lack of vigilance from manual counting and tracking of surgical instruments. Time-consuming and error-prone, the current tracking procedures jeopardize patient safety by replacing time that should be spent on patient care with time accounting for surgical instruments. VIDI builds smart systems that leverage computer vision to increase hospital workflow efficiency and minimize medical errors by tracking the full spectrum of surgical tools, enhancing inter-department and multi-room collaboration, and seamlessly generating documentation and analyses for hospital staff. AsphyxiAlert addresses the need for a tracheostomy alarm system that alerts caregivers in the event of accidental tube dislodgement and tube occlusion. AsphyxiAlert’s dual purpose device houses sensing technology to warn against these two emergencies, with the ability to add extra features for the home consumer. In the case of airway compromise due to a tube dislodgement or blockage, the device will remotely display critical warnings to a personal electronic device or nursing station module. Using big data, the team will tailor the algorithm for each patient’s breathing to personalize the system. This safety device is for home and hospital/rehab facility use in both children and adults. While saving lives is AsphyxiAlert’s primary goal, this device can prevent costly hospitalization, consumption of resources and provide an early warning system as an FDA approved medical device. Currently at UC Berkeley marginalized students receive little to no mentorship or resources to conduct research. Students of color perform low rates of research and campus research programs have low acceptance rates of underrepresented students. Of the 54 undergraduate research programs on campus, 12 are directly for first-generation, low-income, historically underrepresented students – however these programs often have limited resources to offer and/or limited space. Mentorship for underrepresented students is also lacking, with university faculty consisting of few scholars of color. Through a series of workshops, UROC will equip students with key skillsets for conducting research, including: designing research questions, creating literature reviews, analyzing primary archives, and designing methodologies. The healthcare field requires people who can navigate cultural barriers to communicate with and comfort patients. However, the current underrepresentation of minorities among health professionals is detrimental to the quality of patient care in the healthcare system. Helix is a non-profit organization working to diversify the healthcare workforce by facilitating direct exposure to health professions for high school students from minority backgrounds, allowing students to explore potential health careers. Attending Helix’s free one-week immersion program and subsequent four-week health internship will provide aspiring pre-health high school students with an unparalleled opportunity to participate in biological and clinical skill labs, obtain a CPR certification, and shadow a variety of health professionals from similar backgrounds. Through the Helix experience, students will not only discover and develop their interests, but also realize that they are not alone in their pursuits and that success is attainable. There will be one million unfilled technical jobs in 2020. There are 2,220,300 people in the U.S. prison system. Opportunity Through Data hopes to address this gap in human capital while simultaneously reducing recidivism rates in California prisons and increasing the number of women, especially minority women, in technical roles. The project is centered around a ten week certificate course on data science for inmates who have attained their high school diploma or GED. The course, taught by university students and industry volunteers, will connect women to lucrative data analysis jobs upon release from prison. Throughout the course, participants will learn statistics and computer science, and they will complete projects that can be used to bolster their resumes upon release. Opportunity Through Data will develop key industry partnerships to place program graduates in jobs, thus reducing recidivism. Across Burkina Faso and Africa, the inadequacy of skills in the workplace greatly contributes to the non-utilization of the continent’s human potential. This issue, rooted in the inadequacy of the education students receive in schools, explains their low employability and lack of skills to innovate. LEAD emerges in this context with a mission to prepare students for the workplace in Africa. The school will offer a unique curriculum aimed at immersing students in general education, as well as practical and technical education, all in a framework focused on developing entrepreneurial thought and action. LEAD will nurture students who have the skills required for successful entry in the workforce, and who will use their entrepreneurial skills and knowledge to innovate on the technical and practical skills they learn in the school. LEAD aims to graduate not just qualified job seekers for Burkina Faso and the continent, but also job creators. Witnessing the long-standing and urgent social need for accessible and affordable professional training in special and inclusive education in Mainland China, the Special Education Professional Enrichment Training (SEPET) Team will establish a learning channel for special education professionals through China’s most popular mobile social application “WeChat.” This channel can hold mobile distance training courses and help disseminate open resources, functioning as a mobile resource hub with regard to inclusion of students with special educational needs in mainstream public schools within China and beyond. Through continuous and effective professional training and growth, course takers are enabled to better facilitate and ensure inclusion of school-aged children with disabilities in mainstream public schools by, in particular, tackling safety issues through behavior intervention and management. In most LMICs, the average woman attends one prenatal care visit when she first realizes she is pregnant and does not return to the health care facility until it is time for her to give birth or after she experiences severe health outcomes. Preeclampsia is the second leading cause of maternal mortality; accounting for the deaths of thousands of women and babies annually. Preeclampsia is difficult to diagnose because most symptoms mimic many physiologic changes observed in pregnancy, and other complications in pregnancy, hence women are only aware of this condition if they receive routine prenatal care or upon progression of the undiagnosed preeclampsia into a more severe complication; eclampsia. The Early Preeclampsia Detection (EPED) Strip is a low-cost, diagnostic test for preeclampsia that provides a home-based method for women to self-screen for the development of preeclampsia alongside empowering and educating them to seek medical care. Globally, 1 in 3 people still do not have access to a toilet, causing over 3.6 million water related, preventable deaths each year. In sub-Saharan Africa, the number of people without access to safely managed sanitation continues to grow. ElectroSan is reimagining the global sanitation problem as an opportunity. If disposal and treatment of human waste can be made profitable, the generated revenue can be used towards the cost of providing sanitation services and ultimately can help alleviate poverty. ElectroSan’s ion exchange technology has been demonstrated to create a valuable fertilizer end-product from human urine. Through a partnership with a local social venture called Sanergy, ElectroSan can meet the high demand for fertilizer in the Kenyan market, addressing sanitation needs for low-income communities like Mukuru while instilling a self-sustainable sanitation solution. Husk-to-Home siding is a fiber-plastic composite (FPC) material comprised of recycled high-density polyethylene plastic (HDPE) and rice husk. HDPE is a low cost, recyclable, and formaldehyde-free material while the rice husk is used because of its natural resistance to moisture and termites. To ensure that the material is resistant to the elements, Husk-to-Home has conducted extensive flexural, compressive, soak, termite, and accelerated aging tests. These tests are conducted on a prototype board, and were performed to the American Society for Testing and Materials (ASTM) Standards where applicable. Husk-To-Home plans to first sell the board in Southeastern US, targeting contracting companies. Once established as a profitable benefit corporation (b corp), Husk-To-Home will expand to create a replacement for wood composites as a multifunctional material that will be available both here in the US and internationally.